We're big fans of the daylight sensor, seeing as it can sense when night falls and automatically close your doors, stopping mobs from getting in. Very handy if you're crafting in your basement and lose track of time! A daylight detector[n 1] is a block that outputs a redstone signal based on sunlight (or lack thereof). Daylight detectors can be broken fairly easily by hand, but can be broken faster by using an axe. Inverted daylight detectors cannot be collected directly, and they will drop a regular daylight detector. Graphed daylight detector output in clear weather. A daylight detector can be used to produce redstone power in proportion to the daylight or night time. A daylight detector is 0.375 blocks high (3/8ths of a block). Daylight detectors can be moved by pistons.‌[Legacy Console and Bedrock editions only] Water and lava will flow around daylight detectors without affecting them. To place a daylight detector, use the "Use Item/Place Block" control. A daylight detector can be "inverted", which reverses the power levels produced by the daylight detector. To invert a daylight detector, use the "Use Item/Place Block" control. A daylight detector activates when exposed to sufficient daylight (daylight detector mode) or when its sky light level drops to 0 (inverted daylight detector mode). An inverted daylight detector activates when exposure to daylight is low enough (inverted daylight detector mode). Sources of block light (torches, glowstone, etc.) cannot activate a daylight detector. activates adjacent redstone mechanisms, including above and below, such as pistons, redstone lamps, etc. A daylight detector has no effect on other adjacent blocks (for example, it cannot power a block the way a repeater can). If a daylight detector has an opaque block above it, then it will emit a weaker signal, or none at all, as it is directly proportional to the sky light. The daylight detector power level should be 0 from time 13680 to 22340. Using a daylight detector will invert it. However, the output of the inverted detector is not a simple inversion of the daylight detector’s output; it uses a much simpler algorithm that depends only on the level of light from the sky. Specifically, it outputs a signal strength of 15 minus the current light level, meaning that an inverted daylight detector will actually output a strength of 11 at midnight, if it has line of sight with the sky. The effects of shade are applied before inverting, so shade increases the signal strength when it isn't already full, and prevents it from reaching zero. The inverted daylight detector cannot be obtained as an item. Mining an inverted daylight detector will simply drop a regular daylight detector. Daylight detectors can be used as a fuel in furnaces, smelting 1.5 items per block. 0x8 Four bits storing a value from 0 to 15 representing the daylight sensor's current redstone power level. true If true, the daylight detector is inverted. 15 The current redstone power level produced by the daylight sensor. A daylight detector has a block entity associated with it which stores only its entity ID and position (the minimum data for a block entity). 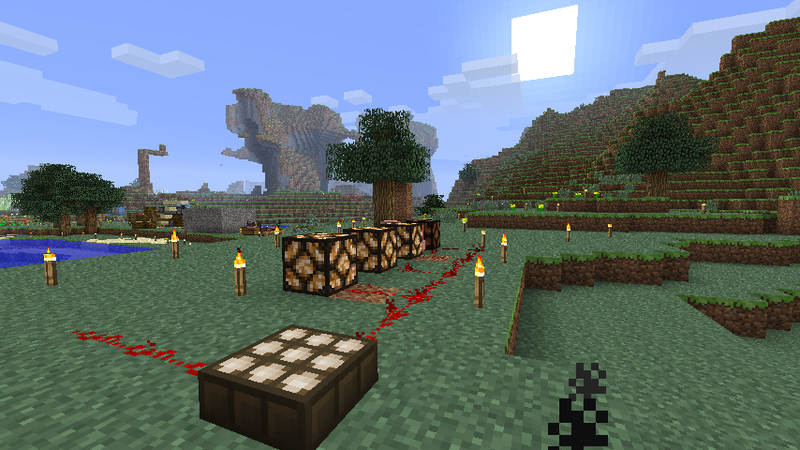 Although the daylight detector's block entity stores no additional data, the block entity ensures that the daylight detector is updated every game tick. Note: This video is outdated, as it was made before 14w31a where daylight detectors could be inverted. Notch suggests that he may implement daylight sensors. Jeb stated that there may be a daylight sensor. Jeb tweeted an image of the daylight sensor..
Daylight sensors were added to the game. Daylight sensors can now be toggled between day/night by using them. Daylight sensors no longer emit signal during the night when sufficiently shaded. Inverted daylight sensors now emits a variable signal at night. The block entity ID is changed from DLDetector to daylight_detector. The different block IDs for the daylight detector got merged into one ID. Prior to The Flattening, these blocks' numeral IDs were 151 and 178. Daylight sensors can now be moved by pistons. The 13w01a snapshot image released by Mojang. Issues relating to "Daylight Sensor" or "Daylight Detector" are maintained on the bug tracker. Report issues there. ↑ Known as Daylight Detector in Java Edition and Daylight Sensor in Bedrock, Legacy Console, and New Nintendo 3DS editions. This page was last edited on 30 March 2019, at 20:19.